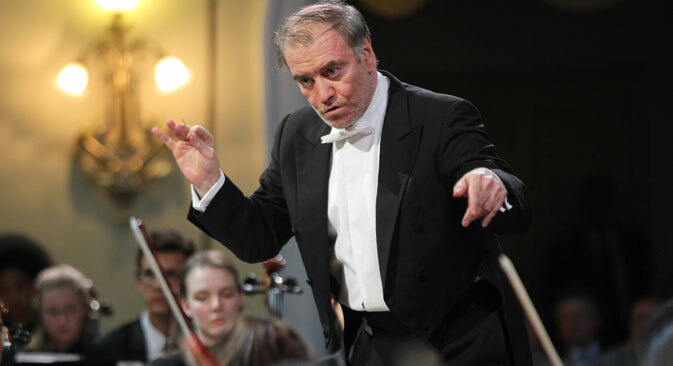 Tour starring Valery Gergiev and Denis Matsuev plays Spanish venues, Bordeaux and Paris. The Mariinsky Theatre's symphonic orchestra, opera soloist Larissa Gogol and its Stradivarius Ensemble under the direction of Valery Gergiev is to tour in Spain and France from March 18-26. The tour starts with a performance of Richard Wagner's opera Tristan and Isolde in Barcelona's Grand Theatre del Liceu. Leading Mariinsky soloist Mariinsky Larissa Gogol and Mikhail Petrenko appear in the main roles of Wagner's musical drama. American tenor Robert Gambill who plays Tristan is always in strong demand for his Wagnerian repertoire. "We have already presented Wagner in Barcelona, Zaragoza and Oviedo. In Spain, we play not only Wagner but Beethoven as well." Gergiev said. "In Madrid we will perform with famous pianist Denis Matsuev." The world premiere of Tempus Verum by contemporary Spanish composer Jose Vicent Egea Insa will be held in Pamplona on March 19-20. Fragments of Wagner's operas Valkyrie and Parsifal will be performed in Oviedo the next day. Beethoven's Ninth Symphony with the participation of the Public Choir of Bilbao will close the Spanish part of the tour in Santander on March 22th. The Mariinsky troupe will continue their performances in France. The Gergiev’s orchestra will present Shchedrin's Naughty Limericks as well as Musorgsky’s Pictures at an Exhibition and the song cycle Children on March 23. The next day the Stradivarius ensemble will give a concert in Bordeaux. Ensemble musicians will play original instruments used in the time of the great masters Amati, Guarneri, Stradivari and Goffriller. The concert will feature Gergiev and British conductor Paul Daniel, music director of the Orchestre National Bordeaux Aquitaine. The Mariinsky's final two performances, March 25-26, take place at the New Philharmonic Hall in Paris where works by Shchedrin, Mussorgsky, Grieg, Shostakovich and Tchaikovsky will be presented.